Used for the mechanical joining of two objects, we are offering a wide range of Metal Fasteners. Our Metal Fasteners are widely demanded for their high strength and durability. Our Metal Fasteners allows for quick and hassle free joining as compared to other methods like welding, soldering, etc. 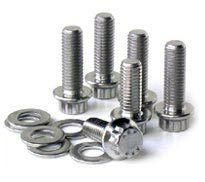 The different types of Metal Fasteners offered by us are Washers, Bolts, Nuts, Anchor Fasteners, Eye Bolt, Threaded Rod, Fine Fasteners & Spares, Foundation Fasteners, etc. Stainless Steel AISI 302, 304, 304L,316, 316L, 310, 317, 317L, 321, 347, 410, 420,904L etc. Carbon Steel Bare Condition, Galvanized, Phosphetised, Cadium Plated, Hot Deep Galvanized, Bloodied, Nickel Chrome Plated, etc. Alloy Steel 4.6 , 5.6, 6.6, 8.8, 10.9 & 12.9 / 'R', 'S', 'T' Conditions. Non Ferrous Metal Copper, Brass,Aluminium, Titanium, Nichrome, Al.Bronze Phosphorous Bronze, etc.